Good looks are definitely a boon for any individual. It feels good to look beautiful and boosts the level of self-confidence. Moreover, as far as facial beauty is concerned, the eyes steal the limelight. Nevertheless, no matter how beautiful your eyes are, having dark circles make them look unattractive. In fact, it makes you look aged and sick. I have been a victim, but thankfully after trying several commercial cosmetic products which hardly works, I got rid of it using natural home remedies. If you are tired and sick of dark circles and looking for the permanent cure, then here’s the post you can’t afford to miss. Today in this post, I am going to share with the top 28 natural home remedies to get rid of dark circles permanently. Thousands of individuals are battling the problem of dark circles every single day. Sometimes, even the prettiest of women, often top-level models and actresses, have to depend on concealers or other costly makeup products to hide the dark skin underneath their eyes. As I said, I have been and experienced the pain of having dark circles, it feel pathetic. Every morning, when I looked into the mirror and saw my face with dark circles, it pained a lot and in a way, that feeling itself motivated and made me determined to find out its permanent solutions. Like many, I also tried various products, but nothing worked. I started exploring alternate methods and did a lot of research, took help of my doctor friends and beauty experts and found out some of the easiest natural remedies that actually worked. I am sure there are many who are looking for the permanent cure of dark circles and hence this post. The methods and remedies are very easy and effective and I hope that you all benefit from them the way l have. Today’s generation expects result overnight and so they go for all the expensive market products that promise instant miracle. However, in this process, some end up worsening the situation. Remember that your face, especially your skin near your eye is one of the most sensitive body parts and you must think twice before applying anything on it. You must know that some of these fairness products may contain chemicals, contact to which might harm your facial skin. Therefore, my personal preference is, to use the common natural ingredients that may take a bit time, but will give results in a safe and permanent way. Well, without wasting any more time, let me start the discussion, but at first, I want to discuss the causes that result to dark circles. The unhealthy lifestyle, pollution and stress, all contribute to darkening of the skin underneath your eyes. Besides these, various other factors also lead to dark circles knowing which; probably will help you get rid of them faster. Listed below are some of the most common reasons behind under eye circles. With problems, come the solutions. You just have to know the right ingredient and the right method to use them. I will help you with some of the easiest natural home remedies to get rid of dark circles permanently. 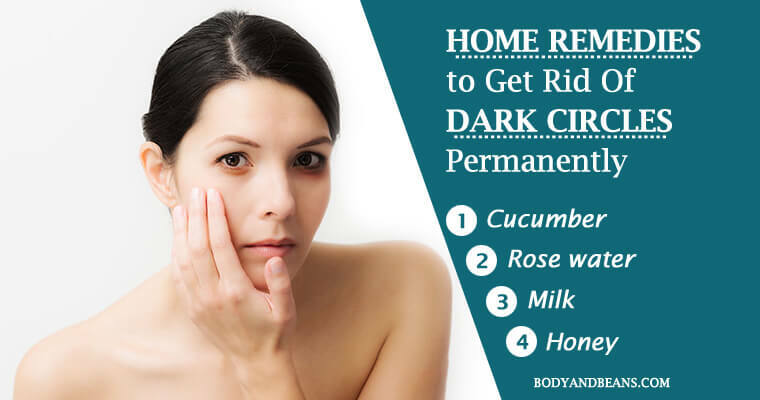 This is perhaps the easiest and the most popular home remedy to get rid of dark circles that has been used since ages. This is because antioxidants like orientin, cucurbitacins and vitexin present in it are very effective in lightening the dark skin underneath your eyes. Besides the application of cucumber freshens and soothes the affected area. You need to cut thick slices of cucumber and then keep them in your refrigerator for half an hour. Then place them over your eyes in a way that they touch the affected areas. Let it stay for 15 minutes and then splash cold water on your eyes. 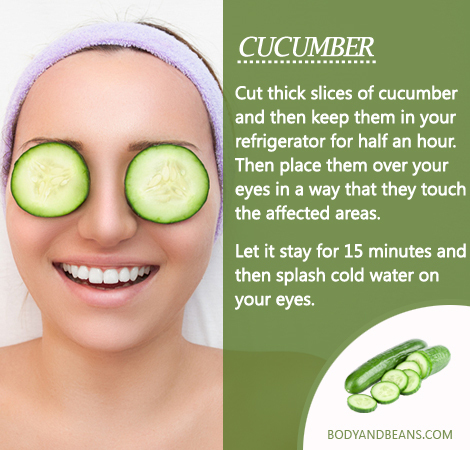 Another method is to extract the juice from cucumber and apply on the dark circles before going to bed. Then wash it off in the morning. Daily usage of cucumber helped me get rid of my dark circles and I am sure it can help you too. 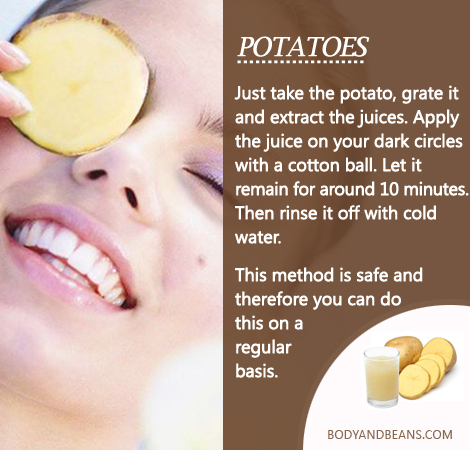 The bleaching property of potato makes it one of the best natural home remedies to get rid of dark circles. Besides, it contains starch, enzymes and Vitamin C those help lighten the skin tone as well as nourish the skin under your eyes (source). Just take the potato, grate it and extract the juices. Apply the juice on your dark circles with a cotton ball. Let it remain for around 10 minutes. Then rinse it off with cold water. This method is safe and therefore you can do this on a regular basis. Another ingredient that is used in skin care is the rose water. Its skin friendly nature makes it my favorite out of all the natural home remedies to remove dark circles. It nourishes your skin and helps reduce the dark circles easily. The antioxidants present in it strengthen the skin tissues and rejuvenates your skin. 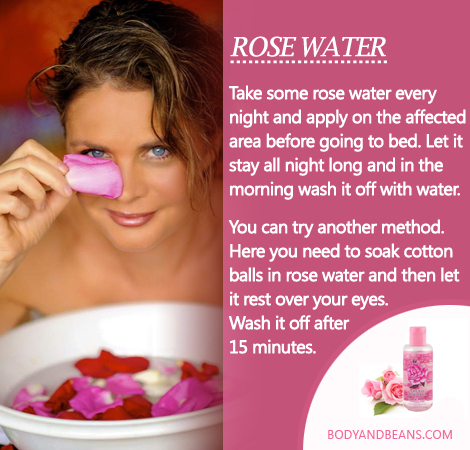 Every night you can take some rose water and apply on the affected area before going to bed. Let it stay all night long and in the morning wash it off with water. Well, in case you are not comfortable keeping it overnight, you can try another method. Here you need to soak cotton balls in rose water and then let it rest over your eyes. Wash it off after 15 minutes. Try any of the above methods for one month daily to get rid of dark circles permanently. 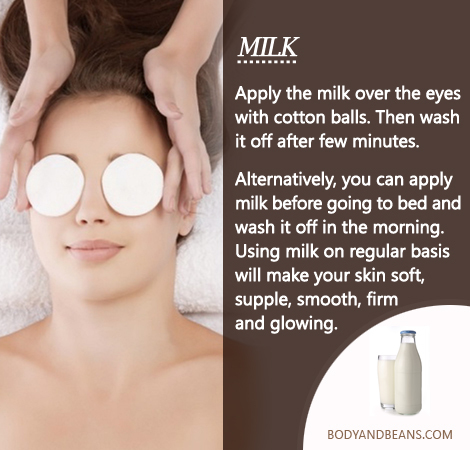 Milk has lot of skin benefits, removing dark circles being one of them. The lactic acid present in it together with proteins, antioxidants, amino acids and enzymes makes milk a natural nourishing and moisturizing agent and helps lighten the dark area under your eyes. In addition, milk revitalizes and tightens your damaged skin. You can also get rid of the fine lines and wrinkles with milk. You need to apply the milk with cotton balls. Then wash it off after few minutes. Alternatively, you can apply milk before going to bed and wash it off in the morning. Using milk on regular basis will make your skin soft, supple, smooth, firm and glowing. Honey contains several minerals and antioxidants, which besides nourishing your skin is one of the best natural home remedies to get rid of your dark circles as well. The minerals and the vitamins make your skin soft, lock the moisture and reduce the dark spots underneath your eyes. It is the perfect food that your skin needs. You just need to apply a thin layer of raw organic honey underneath your eyes. Then wait for 20 minutes and rinse it off with water. To get the maximum benefits you can do this on a daily basis. Lemon juice has skin lightening properties that make it ideal to reduce dark circles. The Vitamin C content in it helps to brighten and rejuvenate your skin. It also cleanses your skin off the germs and the impurities. You need to squeeze the juice out of the lemon and dab a cotton ball in it. Then apply the juice carefully on the dark circles and let it rest for 10 minutes. Wash it off then with water. 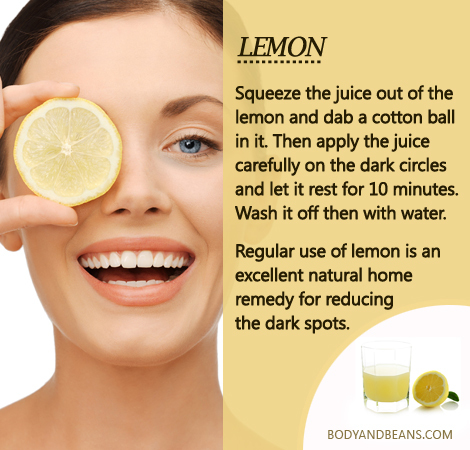 Regular use of lemon is an excellent natural home remedy for reducing the dark spots. However, be careful not to let the juice go inside your eyes and do apply a moisturizer after using lemon in case it dries up your skin. Turmeric is a very common ingredient used in our daily skin care routine because of its skin lightening properties. This property makes it one of the best natural home remedies to get rid of dark circles permanently. 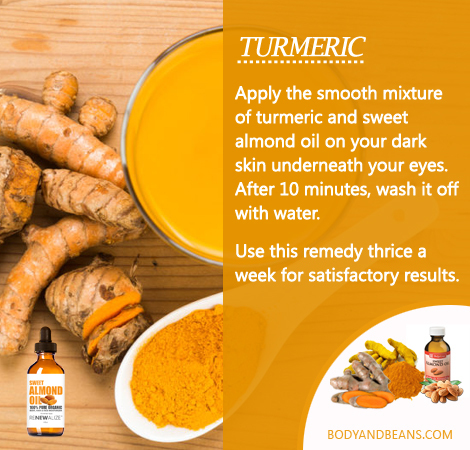 Turmeric also helps in skin nourishment and naturally hydrates your skin. Therefore, in order to get that healthy white glow, you need to apply the smooth mixture of turmeric and sweet almond oil on your dark skin underneath your eyes. After 10 minutes, wash it off with water. Use this remedy thrice a week for satisfactory results. 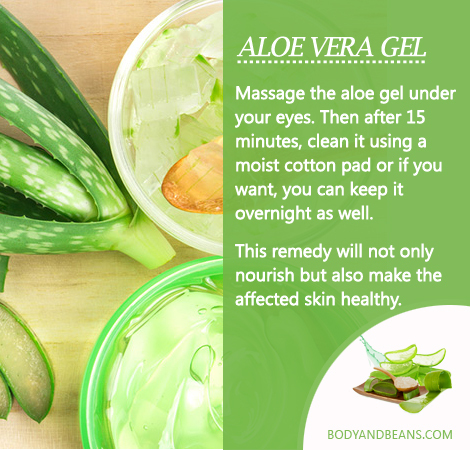 You can get rid of your dark circles with aloe vera gel. It naturally rejuvenates and hydrates your skin. Besides, it reduces pigmentation that is one of the vital causes behind dark circles. You just need to massage the aloe gel under your eyes. Then after 15 minutes, clean it using a moist cotton pad or if you want, you can keep it overnight as well. This remedy will not only nourish but also make the affected skin healthy. 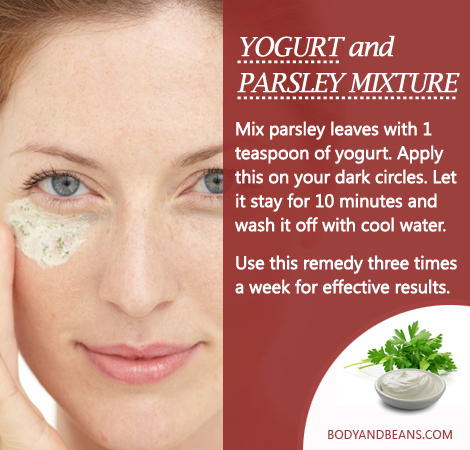 We all know that yogurt is very good for skin but mixing it with parsley makes it more effective in treating dark circles. parsley contains various mineral and antioxidants like vitamin C, beta-carotene, folic acid that helps to have an even skin tone. Besides, parsley also prevents the formation of wrinkles. In order to reap the maximum benefits, mix parsley leaves with 1 teaspoon of yogurt. Apply this on your dark circles. Let it stay for 10 minutes and wash it off with cool water. Use this remedy three times a week for effective results. Another natural ingredient very useful for your skin is the tomato. It is a natural rejuvenating agent that helps you lightens under eye circles. A phytochemical, called lycopene present in it protects our skin from getting damaged. 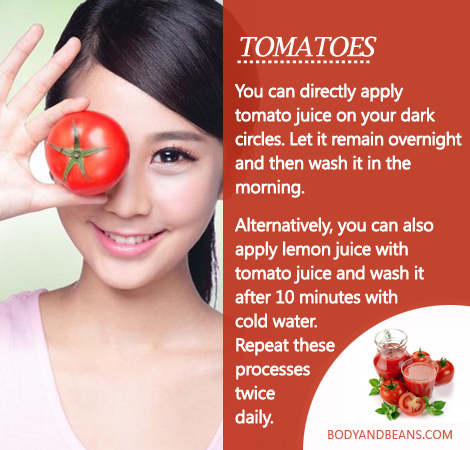 You can directly apply tomato juice on your dark circles. Let it remain overnight and then wash it in the morning. Alternatively, you can also apply lemon juice with tomato juice and wash it after 10 minutes with cold water. Repeat these processes twice daily. However, if you have a sensitive skin like me, you may add rose water into it as well. Dark circles are often caused when the blood vessels underneath your eyes dilate. Tannins present in green tea have astringent properties, which constricts the dilated blood vessels and capillaries. This reduces the appearance of the under eye circles. You need to take 2 green tea bags and put them in the refrigerator for a while. Then place them over your eyes for around 15 minutes and wash your face. Daily usage of this remedy will not only reduce the dark spots but also make your eyes relax. 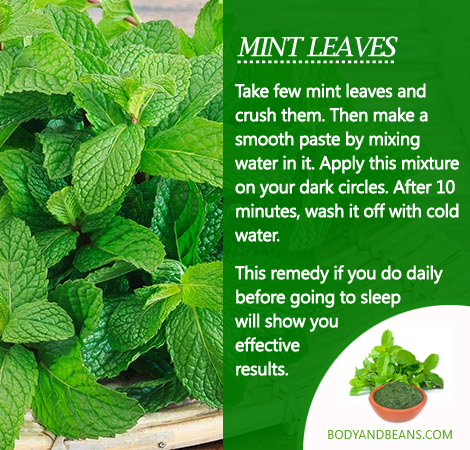 Mint leaves contain Vitamin C that is very efficient in treating dark circles and improving the overall skin health. You just have to take few mint leaves and crush them. Then make a smooth paste by mixing water in it. Apply this mixture on your dark circles. After 10 minutes, wash it off with cold water. This remedy if you do daily before going to sleep will show you effective results. However, you must do a patch test before using it, as some of you might be allergenic to this peppermint leaf. The anti-inflammatory property and the presence of antioxidants in saffron makes it an essential ingredient in skin care. People have been using it to lighten the skin tone since ages and the process is very simple. 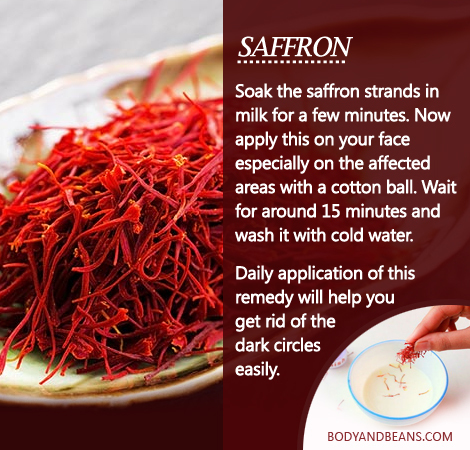 Soak the saffron strands in milk for a few minutes. Now apply this on your face especially on the affected areas with a cotton ball. Wait for around 15 minutes and wash it with cold water. Daily application of this remedy will help you get rid of the dark circles easily. Apple cider vinegar (ACV) contains various vitamins, minerals and enzymes, which helps to rejuvenate and replenish your dark skin. This helps in reduction of your dark circles within few days. Take apple cider vinegar and dip the cotton ball in it. Then apply it on your dark circles with it. Let it dry naturally. Repeat this process two times a day. However, be careful when you apply vinegar, as it should not enter your eyes, so rinse it thoroughly. 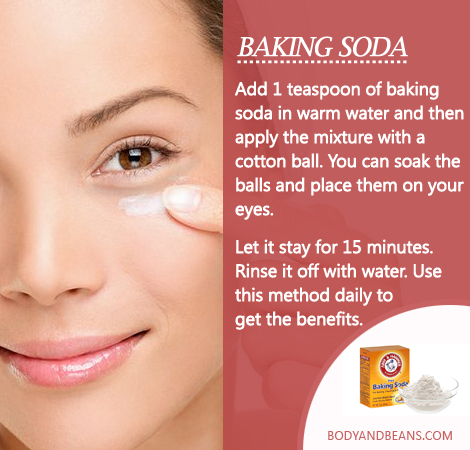 Add 1 teaspoon of baking soda in warm water and then apply the mixture with a cotton ball. You can soak the balls and place them on your eyes. Let it stay for 15 minutes. Rinse it off with water. Use this method daily to get the benefits. Apart from the above natural ingredients, various oils also form a part of the natural home remedies to get rid of dark circles. Applying them correctly, will lighten your skin tone and make your skin look healthy and fresh. The best way to get the maximum benefits is to massage your dark skin underneath your eyes gently before going to bed and keep them overnight. Come let us discuss about some of the remedies using oils which can help you get rid of dark circles easily. Almond oil being an excellent source of Vitamin E is very beneficial for your skin. It works as an emollient and makes your skin soft, glowing and supple. You can use almond oil to get rid of those ugly under eye circles. 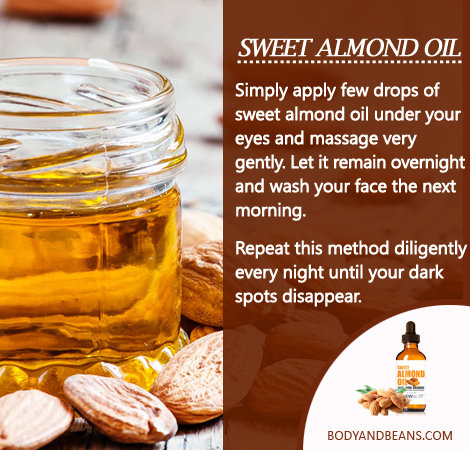 Simply apply few drops of sweet almond oil under your eyes and massage very gently. Let it remain overnight and wash your face the next morning. Repeat this method diligently every night until your dark spots disappear. However, please use only sweet almond oil and not the bitter one. This light oil is very essential for your skin and gets easily absorbed. The Vitamin E content and the presence of other antioxidants give a natural glow to your skin and heal the skin tissues underneath your eyes. 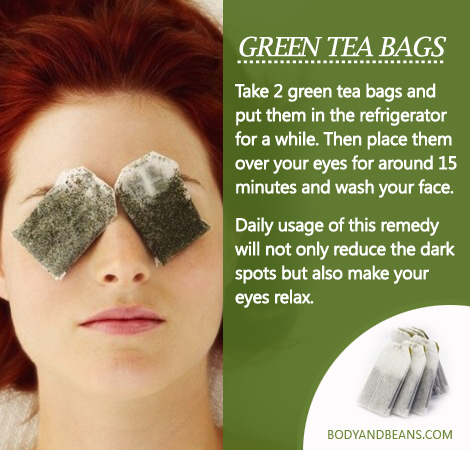 This is in fact not only beneficial for your dark circles but also reduces the wrinkles and the fine lines. 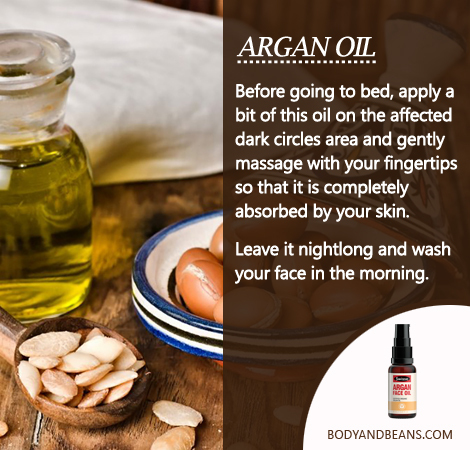 Before going to bed, apply a bit of this oil on the affected area and gently massage with your fingertips so that it is completely absorbed by your skin. Leave it nightlong and wash your face in the morning. Coconut oil naturally nourishes your skin and lightens your skin tone. Application of this oil will not only reduce your dark circles but also makes your skin healthy and young. 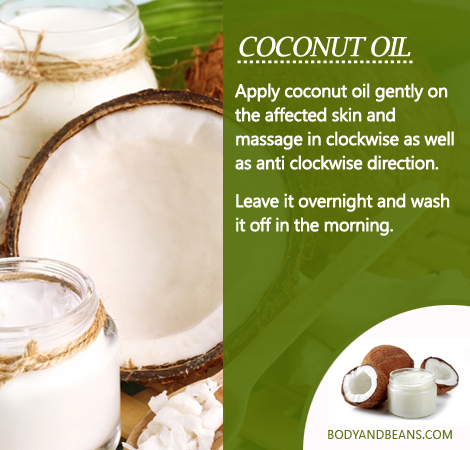 Apply coconut oil gently on the affected skin and massage in clockwise as well as anti clockwise direction. Leave it overnight and wash it off in the morning. Castor oil helps to rejuvenate the dull skin underneath your eyes and thereby help in reducing the dark circles, fine lines and wrinkles. 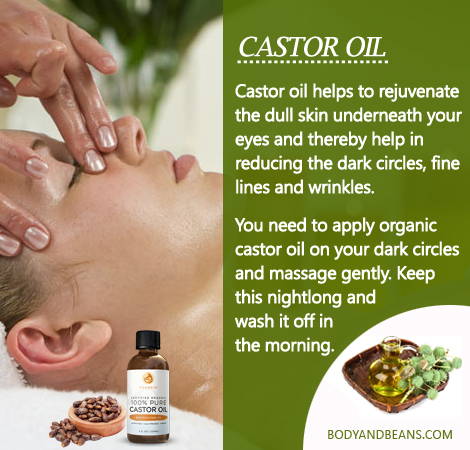 You need to apply organic castor oil on your dark circles and massage gently. Keep this nightlong and wash it off in the morning. 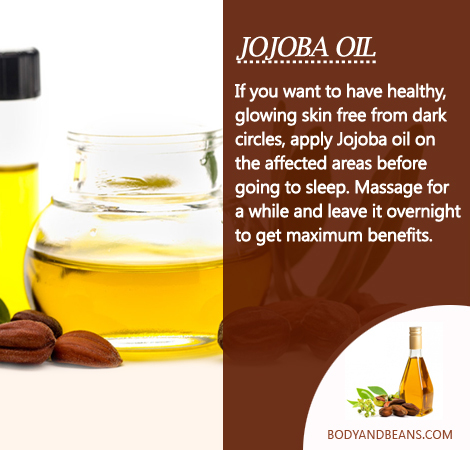 Another oil with rejuvenating properties for your skin is the jojoba oil. It helps to lighten the under nourished and dull skin under your eyes. The healthy fatty acids present in it also help to hydrate your skin naturally. Therefore, if you want to have healthy, glowing skin free from dark circles, apply this oil on the affected areas before going to sleep. Massage for a while and leave it overnight to get maximum benefits. The antioxidant and the anti-inflammatory property of olive oil makes it a healthy ingredient in skin care and is definitely one of the best natural home remedies to get rid of dark circles permanently. It provides the nourishment and care that your skin needs. It also contains fatty acids that makes your skin healthy and naturally hydrates it. Massage virgin oil on your dark circles in circular motion for few minutes. Then let it remain overnight and rinse it in the morning. Simply using natural ingredients and oils will not help until and unless you change your unhealthy habits. There are many things we knowingly/unknowingly do which affects our skin a lot. 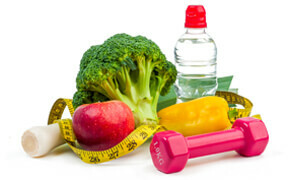 Therefore, making healthy lifestyle changes will help you immensely in your battle against dark circles. Here are a few dos and don’ts that you must follow to get rid of dark circles permanently. Do not rub your eyes frequently: With age, the skin around your eyes becomes thin. It loses the elasticity and collagen and often leads to blood leakage. In such a situation, if you constantly rub your eyes, it worsens the skin. Therefore, avoid rubbing your eyes as much as possible. Avoid alcohol: Alcohol is very damaging for health in more than one way. It harms your skin by dehydrating it, which worsen when you rub your eyes. Therefore, it is better to avoid alcohol. However, in case you cannot avoid it, make sure you drink lots of water before going to bed. This will keep your body hydrated. Quit smoking: Tobacco is very injurious to health, so the early you quit it, the better. With smoking, there is too much loss of the collagen, which increases the chances of formation of eye bags. Therefore, if not all at once, but at least try to get rid of this addiction gradually. Wear good quality sunglasses: Sun exposure can damage your skin a lot and is definitely one of the causes behind your dark circles. Therefore, whenever you are out in the sun for long hours, wear good quality glasses. Also, go for the larger ones that cover the sides of the eyes as well. Reduce pollution: Pollution is another cause behind your dull dark skin around your eyes. So try to protect your skin from the dirt, smoke and outdoor pollution as much as possible. Also, try to keep your house pollution free. Remove makeup gently: Commercial products contain various chemicals which if not removed properly harm your skin even more. Do not forget to remove your eye makeup before going to sleep. However, you must never rub your eyes to remove the makeup as it can damage the capillaries and cause inflammation further worsening your dark circles. Instead, use a gentle eye makeup remover, coconut oil or good moisturizer to remove the eye makeup. Change your sleeping posture: If you are a stomach sleeper, then immediately change it. This is because, due to gravity, all the fluids accumulate under your eyes and constant pressure on your facial skin leads to deep wrinkles. Therefore, try to sleep on your back. Also, remember not to sleep on more than one pillow as it affects your back alignment and thereby can affect your neck. Over to you: which is your goto remedy to get rid of dark circles? Dark circles are a nightmare for so many of us and treating them gets difficult as the eyes and the area near it, is extra sensitive. However, you can use natural ingredient that may have minimal to no side effects, when applied correctly, but helps remove dark circles effectively. I have already shared the extensive list of remedies that you can use to get rid of dark circles permanently. These remedies are trialed, tested, and hence worth a try. You simply have to choose the right remedy as per your skin type and follow the remedies and apply it correctly. Removing dark circles is not an overnight miracle. Therefore, have that patience and diligence. Avoid the commercial products, as they are not always safe. Instead, go for natural ingredients like cucumber, potatoes, rosewater and all those that are ideal for treating dark circles. With these natural home remedies, together with healthy lifestyle, you can get a soft, glowing, dark circle free skin. However, if none of the remedies works for you, you must take the help of a medical expert. Have you used any of these remedies to remove dark circles? Which one benefited you the most? Do share the feedback and feel free to share any other natural home remedy that you think is ideal for removing dark circles. Until then stay happy, stay glowing. I work a lot and sometimes I unfortunately can’t sleep as much as I need. Because of that, I get those ugly looking dark circles under my eyes and bad under the eye bags. I have tried a few different creams before without much success. A good friend recommended Dermalmd under eye treatment serum one and I’m very happy I listened. I have been using it for just about 3 weeks and I’m pleased with the results. Hi, thank you so much for this article! I have dark circles under my eyes and was getting ready to contact my cousin as she sells the Rodan and Fields skincare line. It is very expensive though, and I would much rather try some of the things you suggested! I think I will try the essential oils first, and maybe even yoga. Thanks again! I love this information….thank you.